A week after Wigan's Gabe Hamlin became the fifth top-flight rugby league player in the past 20 months to be charged with an anti-doping breach, Sale prop Jake Pope became the first player to be found guilty of twice breaching the Rugby Football Union's (RFU) illicit drugs policy. Just 10% of all tests carried out by Ukad during that time were done on behalf of the (RFU) and Rugby Football League (RFL). 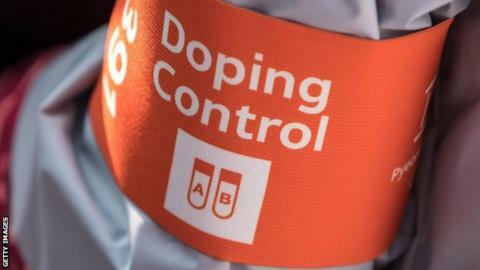 Ukad, which conducts testing in more than 50 sports, has said its approach to doping control is "intelligence-led", focusing "finite" resources where "greatest public interest and where the main threats to clean sport lie". Figures obtained through a Freedom of Information request showed a total of 288 samples were collected from 528 players to make an appearance in rugby union's Premiership, while 328 samples were collected from 406 players to feature in rugby league's Super League. The RFL said its anti-doping education and testing programme was "comparable to other similar sports when taking into account the number of participants and budgets" and that there will be "an increase in testing over the next two years". A spokesperson for the RFU, which also runs its own illicit drugs programme, added: "The RFU and everyone involved in rugby take their anti-doping responsibilities seriously through the delivery of a comprehensive, risk-based education and testing programme." Professor Ivan Waddington, an expert in doping in sport, said both rugby codes are high risk for doping as "the improvements in physical performance associated with drug use are quite substantial". "There is clearly a case in rugby - both codes - that there should be higher rates of testing," he added. "For many years now there have been widespread suspicions, supported by drugs-test findings, that drugs use in both rugby codes is not at all unusual." The Football Association's (FA) anti-doping programme was by far the most comprehensive of any sport in the UK, with 46% of all tests carried out by Ukad done so on behalf of the FA. By contrast, cycling and athletics combined only accounted for 12% of tests. However, many individual sports are also covered widely by international agencies, with Ukad's figures for athletics, cycling and swimming subsequently scarce in comparison to football. When it comes to anti-doping, the FA is understood to outspend every other team sport's governing body by millions of pounds, with each individual drugs test thought to cost between £700 and £1,000. Since 2015-16, there has been a 140% increase in the number of tests carried out on Premier League players and a 96% rise across the English Football League - something the EFL said it "welcomes". In the top flight, 1,923 samples were taken from 515 players who made at least one appearance during 2017-18 - an average of 3.73 samples per player. Jenni Kennedy, the FA's head of integrity, told BBC Sport it "operates one of the most comprehensive national anti-doping programmes in the world". She added: "Although incidents of doping in English football are very rare, it remains a priority for the FA to find and sanction anyone found taking performance-enhancing or recreational drugs." In total, 4,495 samples were collected on behalf of the FA without a single failed test in that time - although Peterborough United defender Josh Yorwerth has since been given a four-year ban for evading a test. The England and Wales Cricket Board (ECB) said it takes anti-doping "very seriously" and that there had been a 50% rise in Ukad testing in 2018 compared to the previous year, with a particular focus on the T20 Blast. It added that "working alongside the Professional Cricketers' Association" it also "tests every player in the first-class counties, Women's Super League and national teams twice a season for recreational drugs" as part of an in-house programme. Which sports didn't test at all? Five top-level leagues were found not to have carried out a single drugs test, including the fully professional Elite Ice Hockey League, which describes itself as the "third largest winter spectator sport in the UK". All but one side attracted an average attendance of more than 1,000 during the 2017-18 season, with Nottingham Panthers' average of 5,674 more than 29 clubs competing in the EFL. The Elite Ice Hockey League said testing had been carried out by Ukad during the recently concluded 2018-19 campaign and that "fans can have confidence in the integrity of our sport". The BBL said it was "guided by Ukad's experts regarding the frequency and nature of their testing programme" and that it had "not received any recommendations from Ukad regarding a programme of testing that should be implemented". Three top-level women's leagues - netball's Superleague, rugby union's Premier 15s and rugby league's Women's Super League - also returned zero samples during the time period. While some governing bodies, such as the FA, RFU and ECB, put money towards drugs testing, many sports rely solely on Ukad's publicly funded programmes. "I'm astonished that so many team sports at that level have drugs testing programmes that at best are woefully inadequate and at worst virtually non-existent," said Waddington, who conducted initial research into the level of drugs testing in football on behalf of the BBC in 2003. In response to questions about testing in women's sport and general rates of testing across major team sports in England, Ukad said it runs a "comprehensive risk assessment process" in order to allocate resources for publicly funded testing. "We look into a number of factors - the physiological risk of doping within the sport is one of the key drivers, as is the profile," said Ukad's deputy director of operations Hamish Coffey. "Where a sport has large financial incentives, it has an impact on the level of testing." In January 2018, Ukad was awarded an extra £6.1m by the government over two years, which Coffey said has created an "opportunity to expand". "While we have to prioritise based on risk, there is a risk across all sport and we have to recognise that," he added. A spokesperson for the Digital, Culture, Media and Sport committee said Ukad is "one of the best supported national anti-doping organisations in the world". But Dr Paul Dimeo, an anti-doping expert at the University of Stirling, said Ukad needs even more money if it is "to be relied upon". "A lot ground has to be covered and there are not enough pounds and pennies to go around," said Dimeo. "What happens to the smaller sports, the less well-resourced sports or the sports that don't have a huge inclination to do this sort of work? "The whole system is imperfect because it is a limited number of tests and so few people get caught that I can't imagine it is working very well or is very effective."